ManageWP is a great tool for anybody managing multiple WordPress websites. Giving yourself a central hub from which to update plugins and themes, manage backups and uptime monitoring and perform regular speed and security scan can provide a lot of value to your clients. But there’s more. It can save you and your team time and resources. But with the addition of other SaaS products, you can make the management and maintenance of multiple WordPress websites even easier and more streamlined. At WP Buffs, we pair ManageWP with various other online tools to make managing websites and our customers easier, more efficient and fully automated. We focus a lot of our resources on creating systems and processes to make the management of multiple websites efficient. It’s how we’re able to continue to scale the number of customers and partners we bring on without sacrificing quality of service. Teamwork Projects is the best project management software we’ve found. It allows us to manage new customer and white-label partnership on-boarding like a breeze. Their templates allow us to apply a massive checklist whenever we bring on a new website and systematize our entire process of securing, speeding up and managing a new site. We have template checklists for all the onboarding we do as well as for any new hires we make. I even keep some checklists to make sure I prepare for upcoming WordCamps or time spent offline! Then, Teamwork Desk makes it easy for us to set up an online help desk for customers to email us for support. This additional tool is internal to Teamwork so our Support Buffs can move between on-boarding new customers and answering support tickets seamlessly. It even allows us to add multiple inboxes! This is the centerpiece that allows us to service clients for our white-label partners. The reporting capability here is also extremely helpful. I’m very data-driven in my decisions to lead the business, and seeing how our team has performed as it relates to customer happiness, average resolution time and average response time helps me make decisions that provide more value to our customers. For example, I found that resolution time across all tickets wasn’t quite where I wanted it. After seeing this in my monthly report review, I added a trigger that automatically emails a ticket owner if their ticket isn’t solved within 12 hours. This kind of data-driven change helps keep our entire team accountable so we can be honest about where we’re not doing well and improve. At the same time, it helps us celebrate the wins when it comes to statistical improvement. And then there’s Teamwork Chat. This final Teamwork tool allows our entire team to discuss issues internally. 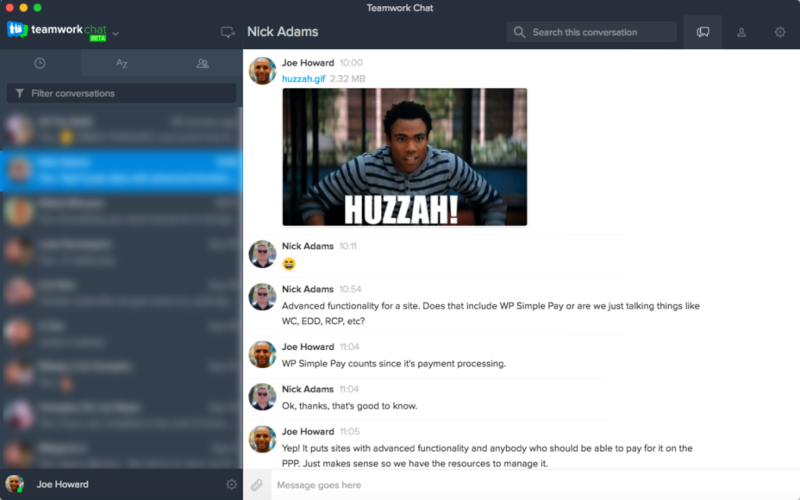 Think of it as Teamwork’s attempt at Slack. The different chat rooms allow us to discuss actionable to do items now instead of bombarding each others’ inboxes. Nick and I are always talking about something here. Whether we’re discussing our services or just sending gifs to each other, Teamwork Chat helps to minimize unnecessary email. This is huge for us since we like to focus on helping customers win, not checking email. While ManageWP helps us maintain WordPress sites, Teamwork provides the infrastructure we need to do this in a systematized and scalable way. ManageWP can help you manage websites but you need something like Teamwork to build a sustainable business that does this. If you want to put all your attention into managing websites, here’s what you don’t want to be spending time on: an expensive checkout process that’s overly-complicated. Plenty of small companies do this when all their customers really want is an easy and reliable way to check out. Stripe is going to be your processing system of choice. Their fees are on par with many of the other merchants out there but it’s the simplicity and user experience of their dashboard that really makes things easy. But implementing Stripe on your website can be a real pain. It was built for developers, so you’ll probably need the support of someone technical if you want to implement it directly into your website. Or you could just use a plugin called WP Simple Pay. This plugin connects directly to your Stripe account and allows you to accept payment with just a few clicks. No need to implement a customized WooCommerce cart and add complexity to your sales funnel when it’s not necessary. You can always get more complicated down the line, but start off with a simple, elegant solution and grow from there. 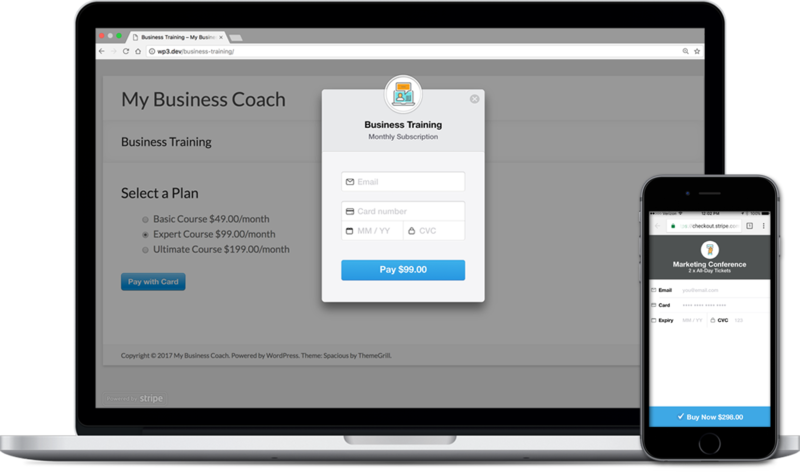 With additional add-ons, you can easily create subscription payments as well. 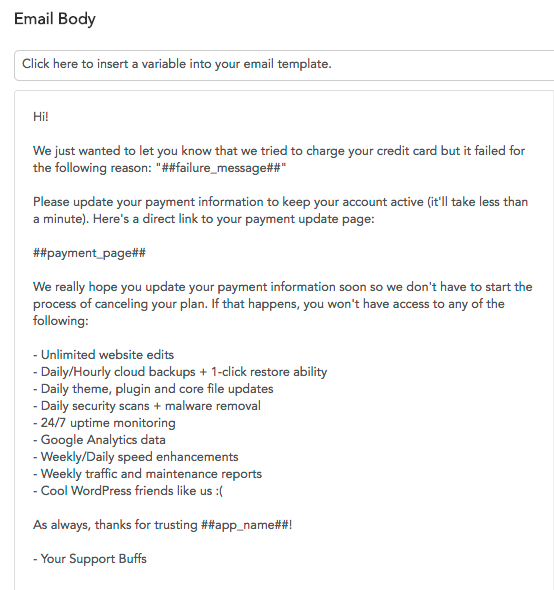 If you’re selling WordPress maintenance service or ongoing support, this payment processor and plugin combination is a great way to get you off the ground fast and accepting new paying customers easily. This piece of software is something that’s been an absolute game-changer for us. The one area where Stripe falls short is allowing your clients to change their payment information or manage their subscriptions. Stunning is the automated solution that handles this automatically for you. If a payment doesn’t go through, Stunning can send an automatic email series asking your clients to add new credit card information. 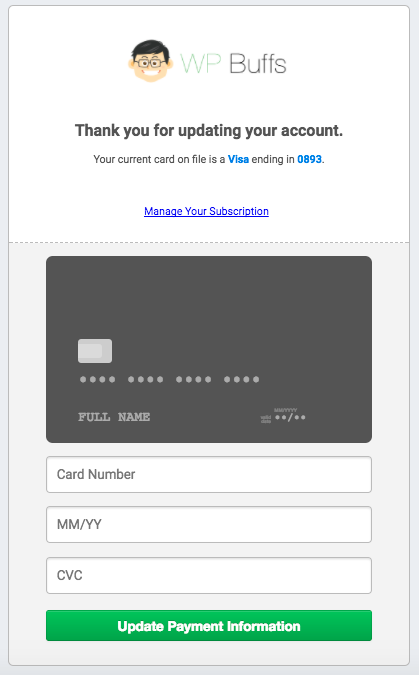 Before their credit card expires, Stunning already knows and sends them proactive emails letting them know that their card is expiring soon and that they should update their billing details. 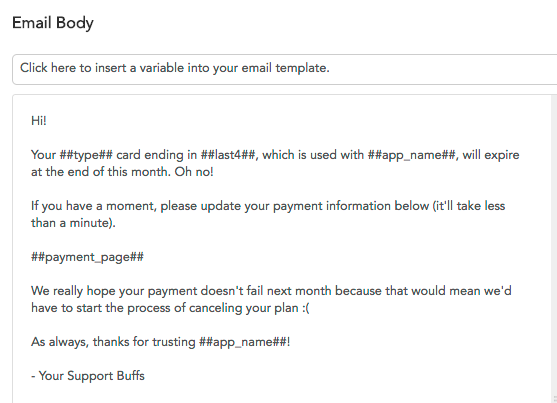 I can even have WP Buffs customers reset their credit card information and manage their subscriptions directly on wpbuffs.com. From customized receipt emails to full management of their Stripe preferences, Stunning does it all. This gives me and all the Buffs more time to focus on making customers happy without having to spend hours every week making sure accounts are set up correctly. Stunning has recovered ~$4,000 for us in total. Could your small business use an extra $4000? They recovered $700 just this month! And that’s without any manual time spent chasing after clients. 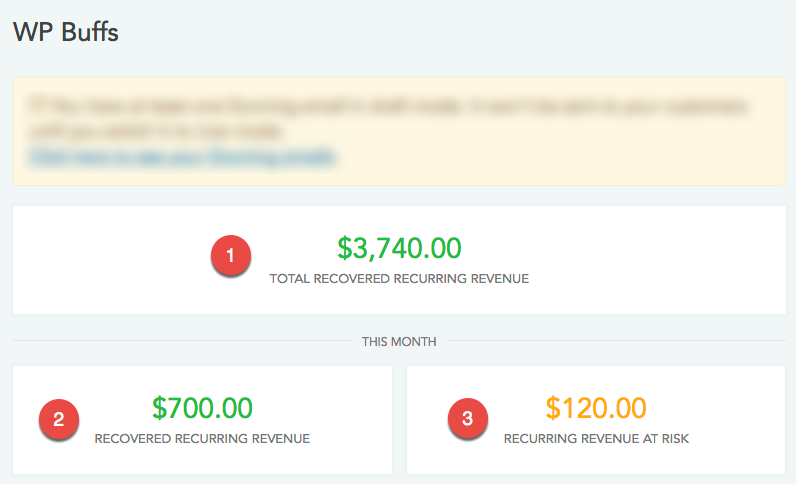 It looks like we have $120 of revenue at risk this month. This helps our team be proactive! If you’re managing websites for your clients, you’ll need to put a lot of blood, sweat and tears into making sure they have a 10/10 experience. The less time you can spend on managing accounts and customer data, the better, so using Stunning to automate this is definitely the move. 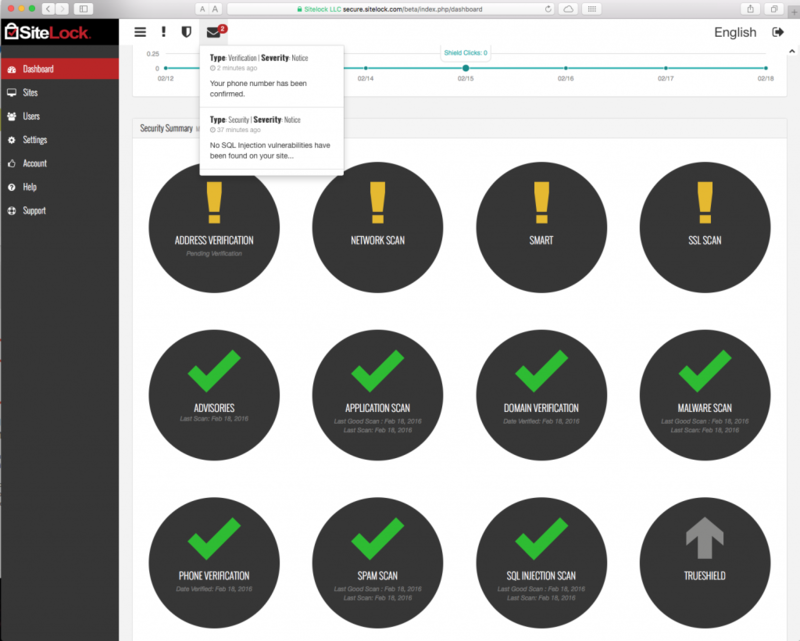 The ManageWP security scans are a great way to stay up-to-date with any vulnerabilities or malicious code on the websites you’re managing. The only issue is that this is reactive to any problems, not proactive. What are you doing to make sure the websites you’re maintaining are safe so that these scans never come back positive? That’s where SiteLock might be able to help. They offer a partnership program that allows you to use their services for your own business. That means you can secure websites for your client with the help of a plug-and-play solution. There are a few challenges with SiteLock. Onboarding new websites is a challenge and can be somewhat time-consuming. Their pricing is also somewhat substantial, so you’ll have to make sure they fit into your business model and revenue streams and that you’re passing along the cost to your clients. However if you can add their arsenal to yours, it will give you a platform from which to make sure all your client sites are safe and secure, 24/7. If you’re using ManageWP to scan for security concerns, you need to be securing those websites as well. SiteLock is a great resources for security beginners since their partnership allows you to white-label their system and learn the ropes. Another great tool in ManageWP is their performance scan. It gives you results on loading time as well as areas to improve the speed of a website. Again, the problem here is that ManageWP will not give you the most granular information you need to optimize a website for faster loading time. Why not let Pingdom help out here? 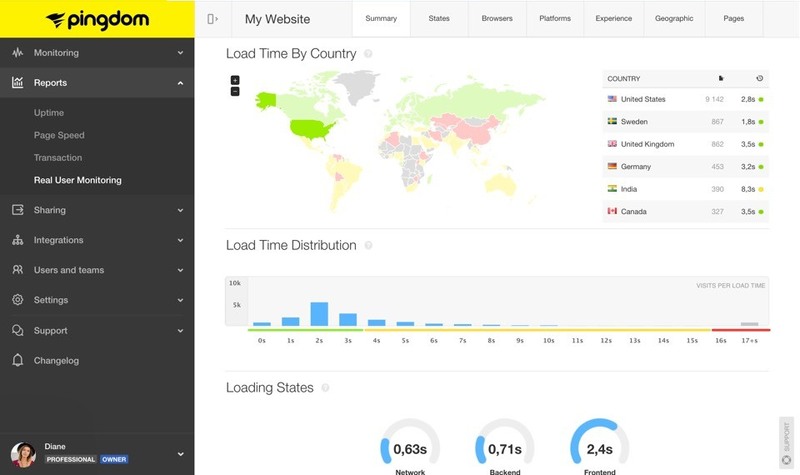 Pingdom delivers reliable and instant insights into you with comprehensive web performance and availability monitoring. With Pingdom, you can understand and optimize the load performance of every element on your page to a better end-user experience. That way, your clients will have a faster website that converts better. If you’re using ManageWP to track performance results, your clients will probably want you to speed up their websites as well. Pingdom will give you actionable advice that you or your team of developers to address. These are 5 tools we use at WP Buffs to take what ManageWP does and turn it into a full suite of services for our clients. But there are plenty of others that will do this too! Which ones are you using? Help us gather a comprehensive list by commenting below with your SaaS products of choice. Sure thing, Max! We’ve upgraded our checkout system from WP Simple Pay to Easy Digital Downloads since this article was published. EDD provided some advanced functionality we needed as we continue to grow and having the ability for people to use our checkout system in more dynamic ways was really important for us. I assume this article was written before the Securi acquisition. Now GoDaddy Pro is providing Securi protection replacing Sitelock. Really good question, Steven! I think a lot of people run into this issue; you’re definitely not alone here. The answer really depends on what customers have access to. Some are on a shared server with no access to a staging environment, so for those sites, we use Safe Updates and manual testing to make sure updates go smoothly. For those with access to a staging environment, we’ll push updates there first and then to the production site. This provides another layer of protection to make sure nothing goes wrong here! We do offer fully managed WordPress hosting to all our customers as well as a free migration to our servers. But our plans are for serious website owners and $40 / month minimum; we understand that doesn’t fit into everybody’s budget. We stay away from developing in local environments, so I’m probably not the best person to talk to about that.